I have a pre-kindergartner that just LOVES to read. Any and every book she can get her hands on she begs me to read. So when I saw the opportunity to review Bash and Lucy Fetch Jealousy I thought this would be perfect for us! 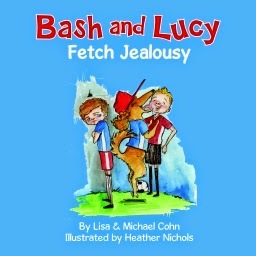 One thing many people probably don’t know is that the authors of Bash and Lucy books are a mother and son team! How great is that? Lisa and Michael Cohn have been guest on the Today Show and they are proud winner’s of the Mom’s Silver Choice Award. Bash is the little boy in the book and he has a dog names Lucy. Bash loves his dog. Lucy help coach Bash’s soccer team and leads them to the championships. But while Bash is enjoying playing soccer and spending time with Lucy another team takes a fancy to her. A team of Special Olympic children ask Lucy to coach their team too. Bash becomes jealous that other children need Lucy’s time and he has to share her. But her overcomes it. This is a great book for small children. It teaches a big lesson that is a hard one for everyone to learn. Bash learns he needs to share. I think it’s good for kids to see sharing is not easy and people have a hard time with it. My daughter was easily able to identify with the book. We have two dogs whom she loves and adores. But when her friends come over and they want to play with her dogs we have jealousy issues. So for us it was good for Peyton to see she is not the only one who struggles with sharing. I read this book to my daughter and a few of her friends. All of them enjoyed it. They enjoyed the pictures and that there was a dog. The illustrations are great. The lesson is communicated at a level where kids can understand. Overall this is a wonderful book and I cannot wait to read more from Cohn duo. If you want your own copy of Bash and Lucy click here. This is the second book in the series. The first book Bash and Lucy Fetch Confidence is also available for purchase. I received Smarty Preschool Adventure complimentary for evaluation purposes. Regardless, all opinions expressed are still 100% my own. I am disclosing this in accordance with Federal Trade Commission 16 CFR, Part 255 Guides Concerning the Use of Endorsement and Testimonials in Advertising.